I bet you didn’t know there’s a sculpture of the Beatles in a small town in Arkansas called Walnut Ridge. It seems the Beatles landed at the airport there in September, 1964 and then moved on to a dude ranch in Missouri for a weekend getaway. There are a couple of things about this that make me smile. One of the biggest is the picture in my head of these guys on a dude ranch – it seems a bit incongruous to me- 4 British guys pretending to be cowboys. I bet they had a blast. The other thing that makes me smile about it is that even though it’s not a secret that they were there, it is kind of cool that they were able to keep it on the down low and it’s still a bit obscure in their history. The fact that the Fab Four were in the United States at a dude ranch when every girl in America wanted to mob them and they were able to keep it quiet is awesome! 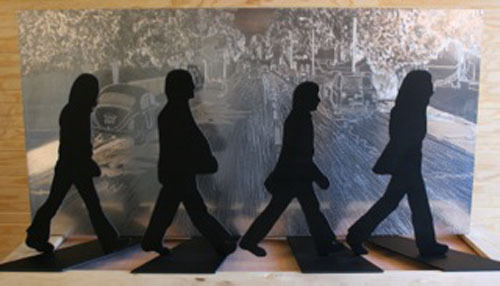 The sculpture itself was made of heavy steel by Danny West of Walnut Ridge and it is a model of the Abbey Road album cover pose. Check out this article for more information. And the sculpture, while iconic, hints at the whole “down low” thing. Very cool! Youâre absolutely right Laurie. Thatâs cool how that happened. The Beatles on a Dude Ranch would have been a hilarious movie!